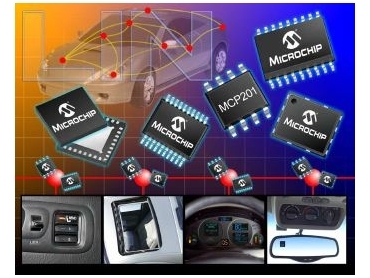 MICROCHIP Technology, represented by Braemac , has introduced the MCP201 device, a single-chip LIN bus interface transceiver with an integrated voltage regulator. By combining the MCP201 with virtually any of the company's PICmicro microcontrollers, designers can now build a complete LIN bus solution. The integrated voltage regulator eliminates the need for an additional external regulator IC, saves board space and meets the LIN bus specification of V1.2. In addition, the industry standard pin assignment of the MCP201 makes it a drop-in replacement in applications where LIN transceivers are already designed in. The small 8-pin MCP201 device features an on-board 5 volt ±5 per cent voltage regulator with a maximum output current of 50 microamps and has the capability to provide higher current output capability with an external series pass transistor. It supports a baud rate up to 20kb and is available in an extended temperature range (-40°C to +125°C). The device provides thermal and short circuit protection as well as protection against loss of ground and load dumps up to 40 volts. CPU, bus activity and local wake-up features are also included. Created as a low-cost, short-distance, low-speed network to connect various automotive subsystems, the LIN protocol enhances communication among these subsystems. The protocol lowers system cost and improves reliability since only three wires (communication + power + ground) are used to connect multiple nodes rather than running multiple individual wires to every node. Microchip's PICDEM LIN Development Kit enables designers to develop solutions easily and efficiently using the LIN bus protocol with PICmicro microcontroller-based systems. Sample programs provided with the kit demonstrate the LIN protocol in a simple distribution network using the sample microcontrollers. Designers also have the ability to demonstrate the integration of the LIN bus protocol into a product for proof of concept. A version of the PICDEM LIN Development Kit supporting the new MCP201 device is expected to be available in January 2003. Samples are available now in an 8-pin SOIC package and volume production is scheduled for late fourth quarter 2002.